Keep herbs fresh up to 3 weeks. Measures, 9" x 3.75"/23cm x 9.5cm. Fits in refrigerator door. Airtight seal won't absorb fridge odors. 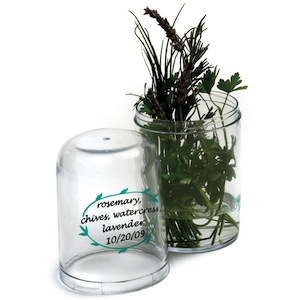 Use a water soluble, removable ink to label and date herbs. For soft, leafy herbs like parsley and cilantro to woody stemmed herbs like rosemary and thyme, even asparagus! Top rack dishwasher safe.